Hilaire-Germain-Edgar Degas, Café-Concert Singer (Chanteuse de café-concert) (ca. 1877), monotype on paper mounted on board, image 18.5 x 12.8 cm, sheet 23.5 x 18 cm. Private collection. The recently concluded once-in-a-lifetime exhibition of Degas monotypes at the Museum of Modern Art accomplished something rare among ambitious monographic shows: alongside works of unqualified greatness, it gave space to imperfect, experimental efforts without lessening our perception of the artist’s stature. This grand display made it clear that, despite his universally acknowledged natural gifts, Degas was all about hard work and persistence. In the case of monotype, this labor was dedicated to a medium that did not best show off his most marketable abilities: his eloquent draftsmanship, his convincing capture of subtle emotion, and his innovative and complex compositions, often with bodies in motion. Indeed, for all the interest in Degas’ remarkable pioneering efforts on its behalf, he created relatively few monotype masterpieces. So why all the fuss? Firstly, the exhibition’s view of Degas as an open-minded seeker is something of a revelation, given the less venturesome artistic camps in which he felt comfortable. Secondly, it provided compelling evidence of his artistic character—if Degas found a process or subject fascinating, he pursued it regardless of the public, collectors or critics. Though personally and socially conservative, even reactionary, in his art Degas was driven by remarkable curiosity and sustained by natural enthusiasm. Like those who understand what it means to do good science, Degas seems to have been unfazed by less-than-hoped-for results or even outright failure. The breadth of inventive work at MoMA proved that Degas found paths to follow even when what he pulled from the press appeared unpromising. Ludovic Napoleon Lepic, The Mill Fire (L’Incendie du Moulin) (ca. 1870–76), one of the 6 monoprints exhibited from the series Views from the Banks of the Scheldt (Vue des Bords de lEscaut), etching with monoprint inking, image 34.3 x 74.4 cm, sheet 45 x 81 cm.The Baltimore Museum of Art. Garrett Collection. Lepic’s exciting variants are “monoprints” rather than “monotypes,” because their base is an inked etching that could have been identically printed multiple times. The monotype has no such fixed structure to fall back on. Degas created most of his by rolling or dabbing blank ink on a smooth metal plate, usually copper, and then working into the inks with a rag or brush (to wipe away ink in a broad area) or a pointed wooden implement (e.g., the wooden end of a brush that could be sharpened) to achieve a fine white line. Sometimes, however, he simply painted his image on the plate with a brush and/or his fingers. 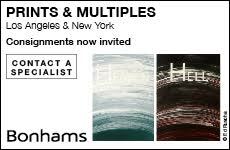 For most artists, surprise attends the printing of every monotype, a consequence of the varying viscosities and drying times of inks, the density of their application, the paper’s moisture, the thickness and freshness of the press blankets and the pressure of the press. One never knows to what degree finger- or brushwork has removed and/or spread the ink in a passage, or whether a purposefully thin film of ink has survived its short ride under the roller. Degas’ small landscape, The River (Museum of Fine Arts, Boston), benefits enormously from the preservation of just such thin pigment. The rapid work in ink on a metal plate always offers the unexpected: under the best of circumstances, the result not only preserves the work on the plate, but looks even better on paper. More frequently, the results can be disappointing. There are, and were, no guarantees. 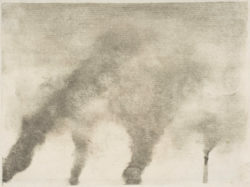 Hilaire-Germain-Edgar Degas, Factory Smoke (Fumées d’usines) (1877–1879), monotype on paper, image 11.9 x 16.1 cm, sheet 14.7 x 17.3 cm. The Metropolitan Museum of Art, New York. The Elisha Whittelsey Collection, The Elisha Whittelsey Fund. The great gift of this exhibition was the inclusion of works whose less-than- ideal displays of Degas’ talents allowed us to understand the risks he took. In the Omnibus (Musée Picasso, Paris) and The Two Connoisseurs (The Art Institute of Chicago) are “quickies” that beg for some refinement of facial details and details of dress. As completed singular impressions, they do not meet our expectations of Degas. 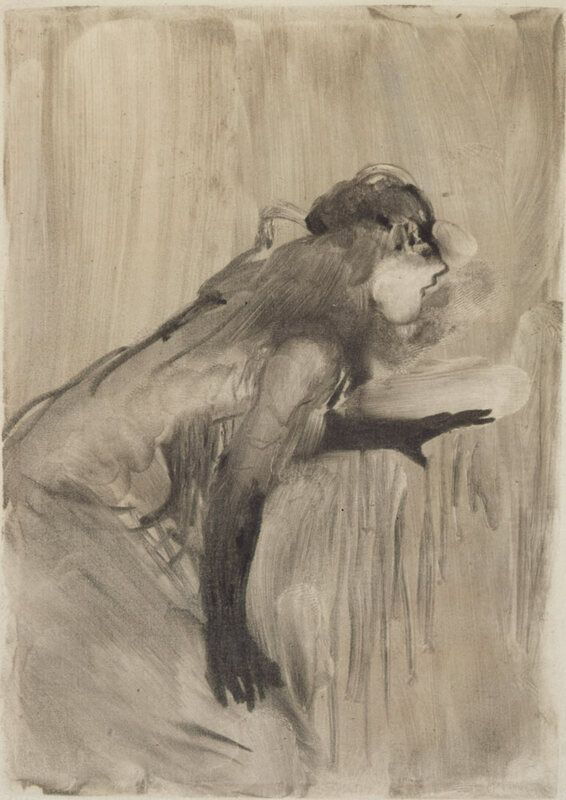 The same can be said for Song of the Scissors (Fogg Museum, Harvard University), where unresolved physiognomy and “press drag” conspire to produce a muddied presentation.8 And yet we know from other examples that, given time and interest, Degas could have employed this muddy monotype as the foundation for a stunning pastel. In contrast, The Jet Earring (Metropolitan Museum of Art) and Portrait of Ellen Andrée (Art Institute of Chicago) show the descriptive subtleties of which Degas was a master and which monotype, even if executed with rapidity, is capable of producing. It may seem unfair to disdain the product of a medium because it has not produced a more nuanced, refined image when it is still attractive to many specifically because of its rough, finger-painting–like immediacy. But is it unreasonable to hold Degas to such a high standard? The truth is that we—the general public—were never meant to see many of these works. As graphic “shavings” from his press, their significance lies, not in their power as isolated works of art, but in their status as steps on a way to other masterful works that continue to puzzle and captivate. The organizers of “A Strange New Beauty” clearly agreed on the exceptional merits of two of the most memorable images, Factory Smoke (Fumées d’usines, 1877–79) and Café-Concert Singer (Chanteuse de café-concert, ca. 1877). Small in size, each was given a wall of its own on either side of a central freestanding stanchion in the first gallery. Factory Smoke acted as the exhibition’s introductory image as well as the cover of the catalogue and reveals Degas’ interest in the aesthetic possibilities of a key component of the industrial landscape. Smoke—nuanced, ineffable, constantly changing like the momentary gestures he captured so brilliantly—was a made-for-Degas challenge. What was impressive about the Café–Concert Singer was the speed with which the artist must have created a believable gesture and posture. Not so elaborately contrived as some of his pastels and paintings, the little figure’s extended arm and black glove are articulated with an authority that lives on in one’s memory. Other standouts ranged in subject and treatment from the early Jet Earring—a compressed prefiguration of where he would take the medium—to the later Woman Drying Her Feet (Femme s’essuyant les pieds, près de sa baignoire), ca. 1880–85 (Metropolitan Museum of Art)—loose, dramatically rectilinear and high in contrast. 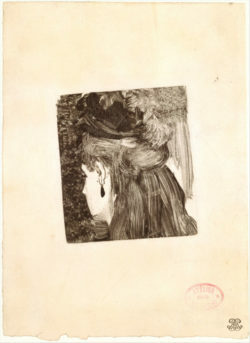 Hilaire-Germain-Edgar Degas, The Jet Earring (Profil perdu à la boucle d’oreille) (1876–1877) monotype on paper, image 8.2 x 7 cm, sheet 18 x 13.2 cm. The Metropolitan Museum of Art, New York. Anonymous gift, in memory of Francis Henry Taylor. Degas’ use of a monotype “underlayment” to enhance the colors of pastel additions was one of the most felicitous pathways taken in his experiments and comprised a good portion of the exhibition. Pastel over monotype, especially a dark first impression monotype, glows in an especially resonant way. Once one notes the distinct appearance of the joined media, it is hard to miss the effect, even from a distance. Unfortunately not included was the pasteled second impression of that first monotype created with Lepic, The Ballet Master (1876), now in the collection of the Nelson Atkins Museum of Art. It offers one of the best examples of how Degas employed this combination of media to capture the dramatic depth and light of the theater stage and its denizens with unprecedented vividness. Less well-known are Degas’ landscape monotype works of the 1890s, almost 30 of which were included at MoMA. After one has viewed those covered in pastel, the plain monotypes can initially appear impoverished, but they have a special stature as pluripotent abstractions—like stem cells, these relatively undifferentiated monotypes could transform into a variety of specific compositions, guided by Degas’ marvelously textured pastel work. As a proselytizer for graphic art in general, Degas established a microculture of experimentation, encouraging friends such as Camille Pissarro and Mary Cassatt to become engaged in making prints. It can be argued, however, that only Degas rose to Olympian heights in the graphic arts of his age, and this exhibition strengthened that argument. His early study of the history of draftsmanship, his youthful exploration of silverpoint on gessoed and tinted papers, his penchant for ongoing experimentation, his keen appreciation and collecting of great paintings and drawings, and finally his own supreme technical facility combined to produce an expansive genius. Degas’ monotypes—successes and failures—are a testament to a devoted explorer, fearless to experiment technically in pursuit of rich artistic rewards.